Welcome to OTR – On The Road from Oslo To Rome by pedal power! This story is about one guy’s (mine) upcoming pedal-powered trip across Europe during the summer of 2010. This trip had its genesis in 1989 while I was working with a German surveyor on the Juneau Icefield. It was the first time I’d ever met a real German, and I guess I was a bit too curious – I kept asking questions about things in Germany, just common everyday things such as, “So, is European toilet paper the same size as ours?” That sort of thing. After a few too many of these ridiculous questions, Martin (the German) said something to the effect of “Hey, we didn’t just come down out of the trees yesterday!” So this got me curious about visiting that part of the world and comparing a square of our TP against a square of theirs. 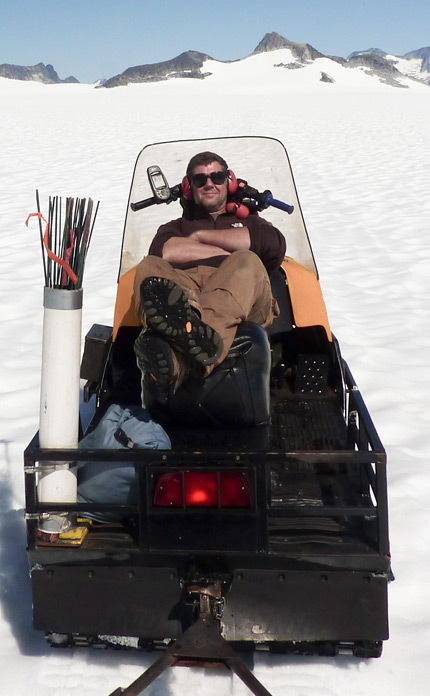 Since 1988, I’ve spent my summers doing glacier research on the Juneau Icefield (near Juneau, Alaska) as part of the Juneau Icefield Research Program. This program began in 1946 and has been conducted every year since. My role is to conduct GPS glacier velocity and height-change surveys. Although I’ve wanted to bike tour Europe for a while now, my first commitment has been to the Juneau Icefield. But time passes, and as they say, the things you regret most are the things you don’t do, so I decided it was finally time to do this thing. Mike, no problem with the t-shirt. But prepare to shell out some bucks – I checked the website of a Harley shop in Berlin ( http://www.hd-motorclothes.de) and t-shirts range from $75 to $115. Shipping is additional. Let me know if you still want one. seems that you have had a nice ride so far. I have made it back from Juneau, but flying back was a hazle. Seattle instead of Anchorage, stress, and 1250 USD for shipping the GPS equipment (Lufthansa instead of CONDOR). THOR was running very well until we brought him back to C10 where he rolled over on a rope behind the BEAR. The window sheet and parts of the front cover has been destroyed, but THOR never dies. It seems that we will need a new cover/window for him next year, I got a couple of pictures for you, where should I displace them? Take care and have an enjoyable last part of your OTR trip. That’s too bad about Thor. We can’t get parts for it any more, so we will have to try to fix it as well as we can. I’d like to see pictures of it – you can send them to me at smcgee@alaska.net. I’m in Italy now (August 30) and will be in Rome in a few more days.